The presence of mixed reality in industries outside of entertainment is constantly growing. With augmented reality specifically, we recently reported on an intriguing way an elevator company was equipping their technicians with HoloLens to make their work a great deal safer and more efficient. Scope AR is partnering up with the construction and mining juggernaut Caterpillar Inc. to build an AR-based live support platform. 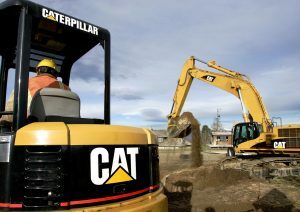 The equipment and machinery supplied by Caterpillar is often used in areas that aren’t easily accessed by technicians and the augmented reality based system will be aiming to provide a solution by bridging that gap. There are so many industries that demand knowledgeable experts when things don’t operate as they should, often causing complete halts in progress as on-site workers attempt to coordinate with off-site help or they wait for someone to show up. So many different devices available to us now alleviate these issues and AR gives us platforms that can show a great deal of information while also showing experts just exactly what the issues are. Scope AR’s Remote AR is a prime example of this, combining voice, live-streams, annotation, and screen sharing to deliver the next best thing to an on hand expert. As major companies such as Caterpillar serve as AR guinea pigs in a way, other companies will take note of any successes and begin to adopt these practices to make a lot of lives easier. Be sure to check out this long list of other applications of augmented reality as well.